Candles are something we love in our home, tending to stockpile after a blackout last year, but mainly for the ambience they create. Christmas was fantastic for candle fans, with mulled spice and deep scents that filled rooms with Christmas spirit. Scents are now becoming lighter and fresher as we head closer to Spring and warmer weather. I generally buy candles from Home Bargains, simply because the candles are a bargain! With a range that covers anything from tealights, right through to layered candles in jars, I can spend some time considering which to add to our collection. A near identical Woodwick candle, also with a crackling wood wick… at almost £20 less! The Crackle Wick, oval, 3 layer candle is priced at £5.99 and was a true bargain not to be missed. The layers are Pink Grapefruit, Sweet Chamomile Tea, Driftwood and White Rose – simply lifting the wooden lid is a scent-sation! It smells absolutely divine, making it a gorgeous Valentines Day gift idea! 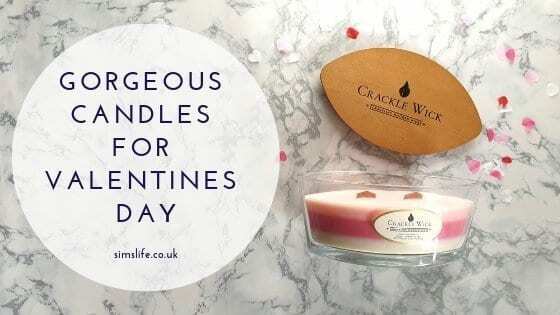 Having been a fan of 3 layered candles over Christmas, I also had to stock up on the Trio of Romantic Scents (£2.99) – featuring fragrances – Vanilla Cupcake, Strawberries and Fizz alongside Fresh Cut Roses. Seriously… if you are struggling with what to buy your partner for Valentines Day, you cannot go wrong with one of these candles… they smell amazing and the tall layered candles do last! If all else fails and you are looking for a scented candle to create a warming atmosphere, the Wickford & Co range from Home Bargain is great – available in a range of sizes, I’ve treated myself to the latest Apple and Raspberry Blush candle to fit in a decorative jar (£0.79p). A light scent that is perfect for this time of year and perfect for any future blackouts!